T1042 is rated 5.0 out of 5 by 9. Rated 5 out of 5 by RichS from Best binoculars ever These are the best binoculars I have ever owned. I expect a lifetime of use hunting, shooting, hiking and whatever comes our way. The clarity is phenomenal. They are excellent under low light conditions. There are a dozen coyotes in coyote heaven that can attest to their quality. Rated 5 out of 5 by CHANGO from Steiner Quality Excellent optics in a more compact size. I bought these to compliment my Steiner 1050r binoculars that I also recently purchased. I knew about Steiner quality from previous experience but was not aware of their extensive line of optics until I visited the website. That's what helped me make my selection. Took them out on a hike and the view was excellent. Rated 5 out of 5 by Pioneer from I bought the Hunting1042 I saw this product in a Hunting Catalog read reviews of them and decided to buy them. Reliability, toughness, and excellent features. So far I am completely satisfied with the product. Rated 5 out of 5 by CatClyde from Outstanding The built quality is excellent. The optics are bright and even in low light condition. The focusing ring is so smooth and fast. It is very comfortable in hands. Plus, the best warranty! Rated 5 out of 5 by BinoQA from Loving this binocular It is very easy to use and hold. It is lightweight and the clarity is superb. It is built with great quality and quality that last for long time. 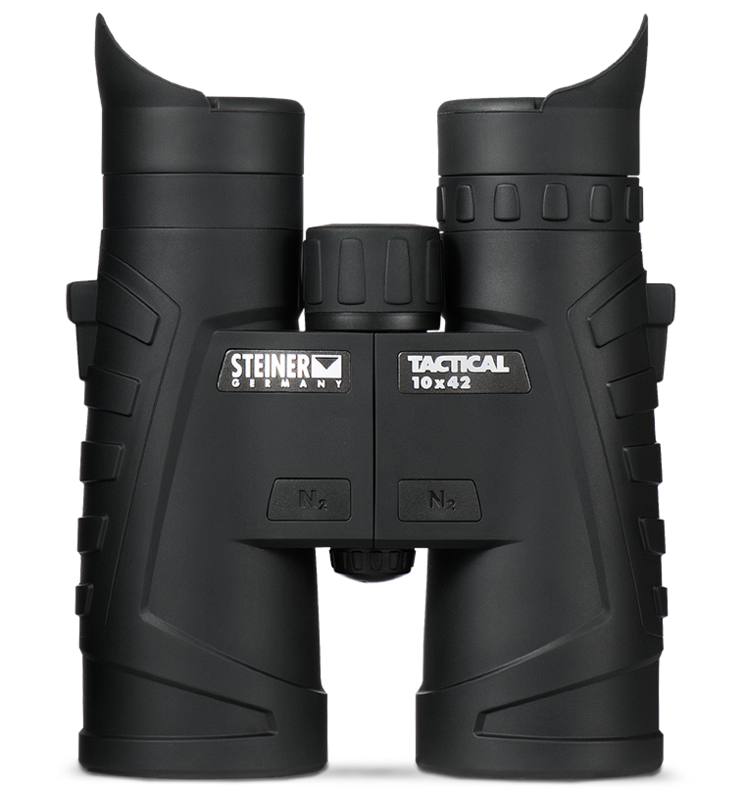 Rated 5 out of 5 by FlyerHiker from Another High-Quality Product from Steiner I’ve only had my new T1042 binoculars for a few days, but they appear to be what I expected from Steiner. I have an older pair of 8x30 Steiners that i’ve used mostly for air shows. We’re going on a walking safari next summer, needed a second pair, and it was recommended to get 10 power. I chose the Tactical over the Safari model and I’m pleased with the clarity at long distances. Rated 5 out of 5 by nazreg from Outstanding This is my second pair, outstanding optics, super clear. I am stuck between the T1042 and the T10422r. They seem to have near the same specs, any help on choosing would be appreciated. The two are identical in every way save for one - The T1042*r* includes the SUMR (Steiner Universal Milling Reticle) for rangefinding, and a right-side eyepiece adjustment for focusing that reticle. Is there an illustration of the reticle if there even is one? T1042 Is it waterproof? Is there an objective lens cover? They are water resistant but not submersible. Do these binoculars have built in reticles? The Item# 6508 does have the SUMR reticle built-in, while the Item# 6506 does not. I am stuck between the T1042 and the XC 10-42. They seem to have near the same specs, any help on choosing would be appreciated. They fold in and out - generally used by folks with eyeglasses. Otherwise, no adjustment. The Wildlife XP will have the highest grade of glass out of those binoculars. The Wildlife XP would deliver superior performance. Hi, T10x42 as tough as M10x50, wich is a best choice for airsoft games and hunting. Thanks! To be honest, those are both great choices. The T series will be a little more compact, if weight and size are an issue.